(The Lukas QVIA QR790-1CH and 2CH models come with the hardwire cable already included in the box). 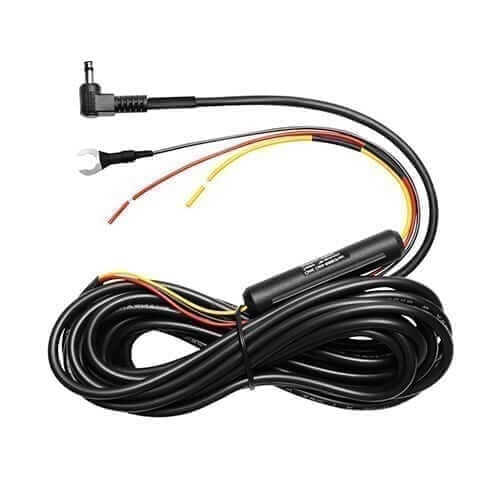 Note 1: The Lukas QVIA Dash Cams will operate without this hardwire kit via the supplied power cord plugged into your cigarette lighter socket. You just won’t be able to use the Parking Mode feature this way as it will shut down when the engine is off. Do not chop the standard QVIA power cord (included in the box) and feed the wires directly into the fusebox. You will void the warranty and damage your Dash Cam. Always hardwire via this QVIA hardwire cable. Note 2: It is highly recommended that any hardwire kit be installed by a certified/qualified Auto Electrician with Dash Cam installation experience. The hardwires need to piggy back off particular circuits in the fusebox. You do not want to tamper with essential safety circuits like airbags or other safety system circuits. Cutting the black cord to the camera body will void any warranty. Note 3: Hardwiring any item to your fusebox could void a new car warranty. Always check with your car manufacturer/dealer before installing a hardwire kit. Always check with your car manufacturer/dealer if a hardwire kit is compatible with your vehicle electrical system before installing. If hardwiring is an issue, a non-hardwire option is the Cellink NEO battery pack.